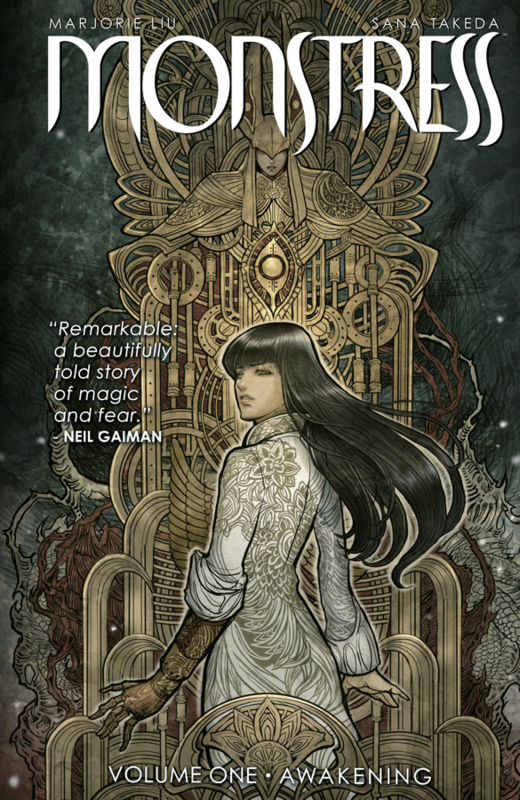 “Monstress” is about the things that make us different, but also keep us the same. It is about the demons that live inside of all of us. It is about a world that once knew peace, but no longer believes in it. It is about finding out who we really are, and how learning that the truth may be harder to handle than what we know. A war is brewing between the Arcanic people and humans. What once used to be a peaceful nation, has now become a world divided by fear and the unknown. Arcanic people are a tribe of beings with supernatural powers. When the human tribes agree that the Arcanic can no longer be trusted, they capture who they can and put them into slavery. Taking away their free will, they are now left to serve human kind out of necessity, rather than choice. Maika is a young Arcanic slave. Losing her arm at a young age, she is desperate to find answers, to know more about who she is and where she comes from. The situation desperate, the only way to find out the truth is to be imprisoned and taken into the heart of the beast. She quickly escapes, with more bloodshed than she had anticipated, and the war between the two tribes is started. Now on the run, with a mysterious psychic link between her and an unknown entity growing, she becomes the target for the humans and other supernatural beings. While wrapping my head around this book, I couldn’t help but think about the Lord of the Rings. J.R.R. Tolkien created a world so vast, a world so deep that it’s hard to imagine that it didn’t exist. This is what “Monstress” feels like. It is a world that is filled with magic and mystical beings that defy our imagination. It is so intricately fleshed out, that you can only wish to spend more time there. With every step of the story, there seemed to be more going on just beyond the woods. It is that deep in its own mythology that it is impossible to contain this world within this one story. Marjorie Liu has written a story that combines a fantastical, mystical world with a social commentary that will span generations. It is a story that aims to say a lot about the world we live in, and it succeeds on every level. Sana Takeda’s artwork takes the world of “Monstress” into a whole new territory, bringing it to life in beautiful, unique and sometimes unexpected ways. Together, Liu and Takeda tell a story like no other. It is destined to become a classic, and it deserves a place on the bookshelf for generations to come.